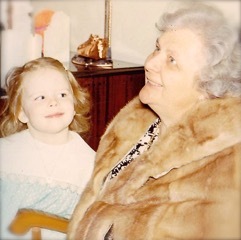 Twelve years ago today, my grandmother, Mary Ann Whipple died. She was, by far, the most important woman in my life. More than a grandparent, she was my mother. Her long life didn’t make grief easier. I got to love and bond with her longer. Life went full circle: her arms cradling my newborn body; later that tender touch with my own children; my arms around her as she left her tired body. My grandmother’s body was a source of great joy to me. She was a grandmother of the ‘60s, so she did not “work out”, have Botox, or color her silver hair. She wore a housecoat over her plump body. She was soft. As a young child, I would lie across her spongy, pillow-like lap while she stroked my head, sang hymns, and hemmed me into the most secure spot in the world. During church, her hand on mine, I would trace the raised, blue veins that lay underneath her spotted skin. She smelled of Nivea moisturizer, Cody pressed powder, and rose; scents that to this day cause me to inhale deeply and smile…and sometimes, like today, cry. We baked. We ate! We delighted in calories: homemade jam, Swedish meatballs, divinity, fudge, and peanut brittle, pull-apart bread, green Jell-O with cottage cheese. Rainy days and evenings were filled with dominoes, The Carol Burnett Show, and Lawrence Welk. Life was slow. It was divine. My hands now have spots; raised blue veins map my hands like rivers. I never look down on them with disdain. In this way, my grandmother lives on in me, and so I embrace this. Grandma, you are tattooed on my heart.